Business owners and property managers understand the importance of first impressions. The look of your parking lot has the potential to entice or drive customers away. Your parking lot must be inviting and clean. If your lot looks dilapidated, faded, or flawed in another manner, customers will bypass your business in favor of competitors. The solution is regular asphalt pavement maintenance. If your parking lot is neglected long enough, it will gradually develop cracks, potholes, and other problems. Consistent maintenance will prevent these issues for several years. This is important as the cost of maintenance is much less than the cost of asphalt repairs. You need paving professionals on your side to regularly monitor your lot’s condition and perform corrective procedures. This will improve the parking lot’s quality and ultimately prolong its serviceable life. We use the industry’s most advanced equipment and procedures to guarantee the flaws with your asphalt pavement do not worsen. Surface treatments are an affordable means of preserving the integrity of your parking lot’s surface. Surface treatments fill diminutive splits. The treatment moves into the asphalt blacktop, strengthens the base, and waterproofs the uppermost layer to prevent problems stemming from moisture. Moisture that seeps into the pavement and fluctuations in temperature eventually compromise asphalt paving, forming ugly and dangerous cracks. It is imperative you have your lot regularly maintained so the cracks can be filled in a timely manner. Crack filling performed right away rectifies compromised asphalt for upwards of three years. The filling procedure requires cleaning, smothering, and break refilling. Sealing cracks and other breaks in Tampa asphalt paving has the potential to preserve flawed asphalt for 3 to 5 years. 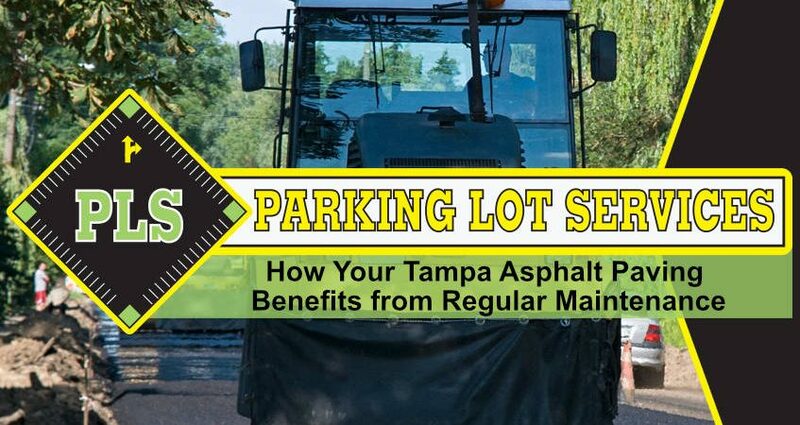 This form of Tampa asphalt paving maintenance is a step beyond split filling. Blacktop material is treated with rubber and applied to the area. This material withstands excessive heat quite well, providing your customers and employees with a reliable space for driving and walking. Asphalt Maintenance is cheaper than a full replacement. This statement is true for small parking lots, complex parking lots, and lots of other types. It does not matter if your Tampa parking lot has speed bumps, signs or other specific features. The bottom line is this important space requires regular maintenance to prove safe, beautiful, and reliable.